So when I saw at the choice for this week’s HBC I was jumping for joy! CUPCAKES! I never have a chance to bake cupcakes! And, I LOVE cupcakes. (The supermarket kind mostly, but I’m not saying anything ‘k). Side note: I actually thought of putting a twist on the whole thing and since I knew most of the bakers love to bake cupcakes out of the regular cake recipes, I almost, converted this to a plain cake – just to be the one that DID not FOLLOW DIRECTIONS this week. I did not have the guts to do it. Yes, I need help – let’s move on. Having read the recipe the night before, I knew this was an easy one. Saturday morning I made my way to the kitchen, took out the eggs, butter and most of the ingredients needed and placed them in the counter to get all nice and acclimated to room temperature. Busted! I dragged myself out of the comfy chair and stepped into the kitchen, turned the oven on and got to work. And right off the bat, I grumble. The recipe yields 16 cupcakes - SIXTEEN! I own a 12 cupcakes pan. THE HELL? There is no 16 cupcakes pans, there is 6, 12 and 24. NO 16 anywhere in sight! Which meant I had to "dirty up" another baking pan and out came my silicon 6 muffin pan in order to make up the difference. NOT GOOD – TIP: let’s stick with standard sizes eh? The rest of the steps were pretty much unproblematic. The cocoa powder (I used Hershey’s dark) is combined with hot water and put aside. 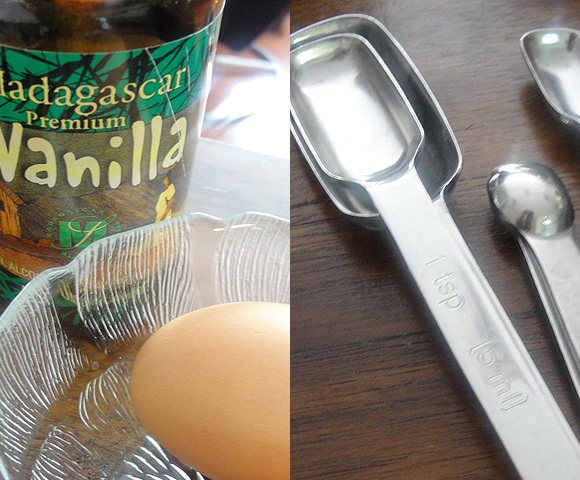 Eggs, vanilla and a bit of water gets whisked about and put aside. Then the dry ingredients (Flour, Sugar, baking power, baking soda, salt) gets whipped, butter goes in with the cocoa paste until blended, then the whisked eggs in two parts gets incorporate and 5 minutes after you started you are ready to fill those cupcakes pans. With a #30 Ice Cream scooper. – Rose you.are.KILLING ME with the equipment! I own four ice cream scooper (don’t ask, since I have no clue why I have four either), two of those scoopers had numbers, and by process of elimination, I came to the assumption that the higher the number on the scooper the smaller the scooper is. Anyone out there wants to confirm this brilliant assumption? So, I used the smaller scooper to fill up the cups in the baking pan about ¾ full by eye-balling it. I did not feel like pressing the electronic scale 16 times after filling up each cup, and it looked about right. Into the oven they went and 30 minutes later, 16 very dark and chocolat-y cupcakes were placed on the cooling rack to fill my kitchen with smells that should be illegal. Rose’s recipe ended there. No frosting, no finishing - Just plain chocolate cupcakes – naked, exposed and bared all out in the open for all to see those imperfect tops – YIKES! I’m sorry Rose, but, Cupcakes without FROSTING? That just wont do. It’s like putting “Baby in the corner" – and we know that NOBODY PUTS BABY IN THE CORNER! So, I had to pick: Ganache? Buttercream? Chocolate on Chocolate? Chocolate and Vanilla? Chocolate and ??? My GOD – the amount of choices! Since Buttercream and I have a love-hate relationship – that was out. And because the last cake was a chocoholic shock, the ganache was also out of the race. Then I remember that I had this weird frosting called: “That’s the best icing I’ve ever had” in my cooking book that I had printed out a while back – waiting for the excuse to make it. With only 5 ingredients and about 10 minutes to whip up and have ready to hit its final resting place I was SOLD. After I had the icing ready, I decided to go all out and pipe it on top of the cupcakes and make them all pretty-like. Out came the piping bag and tips and a lot of mess - Marie would be sp proud! Me: LOVE THEM. As always, Rose’s balance of chocolate goodness is unparallel. 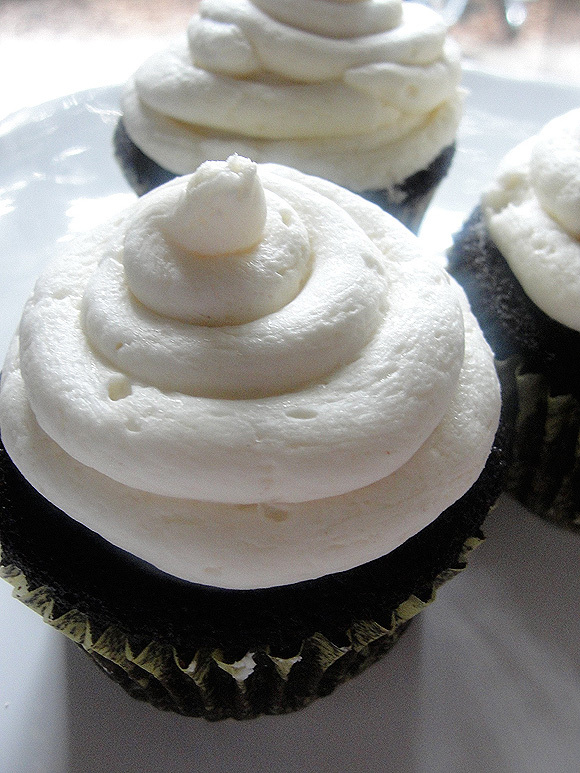 And the frosting, well goodness – I’m thinking of rename it to “The greatest frosting to knock your socks off”. Yes, it’s THAT GOOD. This frosting on chocolate is to die for. Sure, the recipe sounds strange — it has flour in it — but its magnificent. Try it, you’ll see. You’ll love it so much you won’t go back. Disclaimer: No recipe are shared in my Heavenly Cake Baker posts, due to our rules of the bake-along. Unfortunatly, we are restricted in sharing the recipes by the publisher of Rose's Heavenly Cakes. However you can purchase the Rose's Heavenly Cake book here. In a small saucepan, whisk flour into milk and heat, stirring constantly, until it thickens. Remove from heat and let it cool to room temperature. (If I’m in a hurry, I place the saucepan over ice in the sink for about 10 minutes or so until the mixture cools.) Stir in vanilla. Grap a spatula (or as I did your piping bag) and spread/pipe on the cupcakes, or your favorite chocolate cake, or red-velvet cake, or banana cake, or coconut cake or anything that is baked!